As many of you know, I went through a major life change not even a month ago! I packed up every bit of the life that I loved oh-so-dearly in Charlotte, NC, and drove 15 hours north. Not home to Maine... but instead to the Burlington, Vermont area, where I'm working for my first job! In the broadcasting field (both radio and television), when you're in the early stages of your career you really do move for the job. I really do love moving. I think if you have the opportunity while you're young to live in and really experience different parts of this beautiful country, you absolutely should! Going to college in the South was the best decision I ever made, and it's been a fun start to my career to be in someplace new again. However- the one downside to moving around is of course, the act of moving. The further away that you move, the more stressful that it can be. This recent move allowed for a lot of learning in terms of the preparation, actual move, and post-moving experiences. I think that out of those three separate things, I definitely did the best with the preparations. In today's blog post, I wanted to share my top five tips for how to best prepare for a big move, and how to keep your stress levels down with so many changes happening or about to happen! 1. Pack in a way that allows you to label EVERYTHING: I tried to pack the majority of clothes that could be folded without too much wrinkle damage in my luggage (since luggage usually = clothing so that was pretty self explanatory), but the majority of my other apartment things went into dozens of cardboard boxes of all shapes and sizes. The great thing about packing in cardboard boxes is that they're so easy label. You can either write directly on the box, or write on post-it notes and affix those to the box (what I ended up choosing to do!). At the very end of my packing process, I started to run out of time and things got thrown into random boxes. Guess what I still have left to deal with in my new apartment in Vermont? You guessed it- the random boxes! Every box that was labeled was so easy for the movers because they could leave them in the correct room of my new place, and I'd already have an idea of wear the box contents would go. Label, label, label- I cannot stress this enough! 2. Schedule all of your goodbyes well in advance: In addition to all of the packing another difficult part about moving (if you're moving somewhere out of your city/county) are the goodbyes that will be in order with family and friends. I don't have any family in Charlotte area, but I do have lots of sweet friends there who have become like family over the past few years! Start scheduling out and envisioning your goodbyes with those near and dear to you early on. It might be a difficult thing to think about, but if you procrastinate on it too much then you will be consumed with packing and other moving tasks before the big day finally comes, and goodbyes will unfortunately get pushed the side. This is something I could have done better with, as even though I had a delightful little going away party with some of my friends (read about it in this post! ), I did run out of time to say goodbye to a lot of my classmates from broadcasting school. Had I planned better, I could have seen everyone before leaving! 3. Get LOTS of sleep. 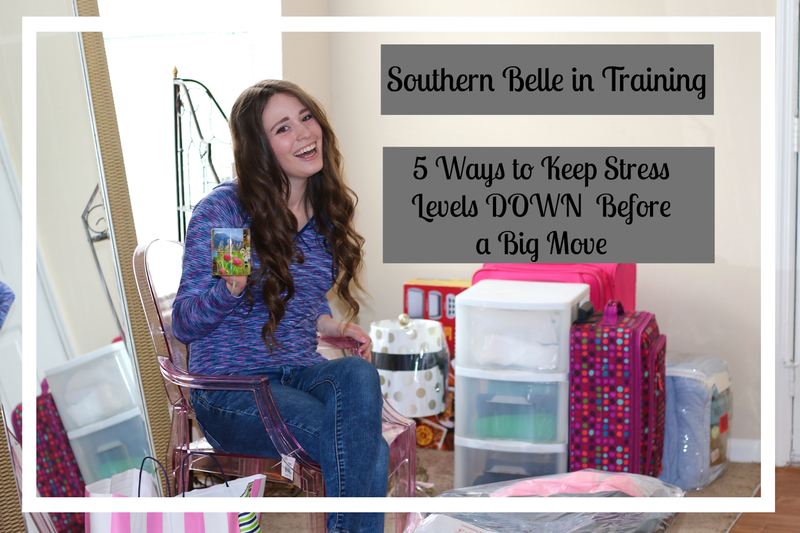 For obvious reasons moving is a really stressful time- both physically and emotionally! Your body will probably need more sleep than normal to function at its best and keep up with all of the tasks that you need to get done. I slept a ton in my last couple weeks in Charlotte. I tried to fight off the urge to nap by going to bed earlier than normal, and it worked! 4. Mentally focus on the PROS regarding your move. There will be days and times when you will be feel overwhelmed with all over the goodbyes and packing, and the thought of closing one chapter of your life. The best way to combat that is by mentally (or even verbally if that helps even more!) reciting all of the good things about what the move will bring for you to yourself. For example- when I would get stressed about Vermont winters or not knowing any people up here, I would remind myself mentally that I was moving to Vermont to begin the career of my dreams, and that I was also excited to get to experience life in a state that was close to my original home, yet still new to me. Focusing on the positives instead of the negatives always helped to bring that motivation back! Of course... if you're just moving across your city or county... you might not have as many dramatic pros and cons. 😉 But moving anywhere is still a big process and it's still good practice to stay positive! 5. Make time for tea! I am a BIG tea drinker, both at home and in coffee shops. (I do drink iced coffee on occasion, but will almost always prefer tea over coffee beverages!) One of my favorite tea brands to buy for my kitchen is Bigelow. Their teas not only taste delicious but are very affordably priced, and they're available and most grocery retailers. Bigelow just announced a brand new line of teas called Bigelow Tea Benefits! The flavors in this new collection are designed to promote everyday wellness. 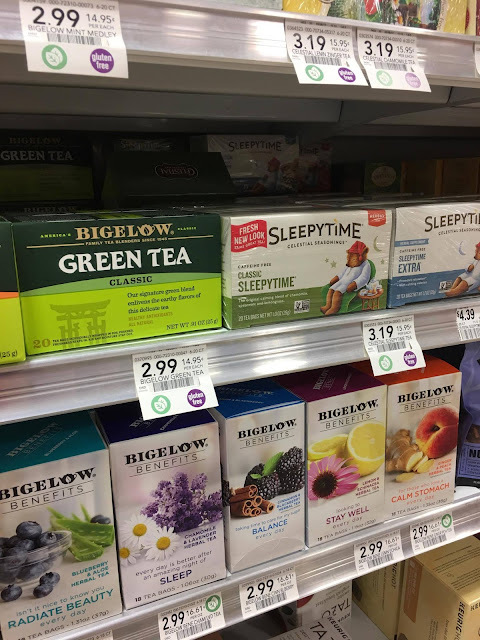 While I was still in Charlotte, I headed over to my local Publix grocery store to pick up a Bigelow Benefits Tea. I decided to try the Cinnamon and Blackberry flavor. This one is a delicious flavor combination which is naturally sweet enough that it doesn't need any additional sweeteners. As you can see in the pictures above and below, I made sure to take time out of packing in the weeks leading up to my move to have tea breaks and take a moment to enjoy my hot beverage and just "breath," even it if meant taking a seat right in the middle of all of the packing - ha! Share your best tips for moving with me in the comments of this post! 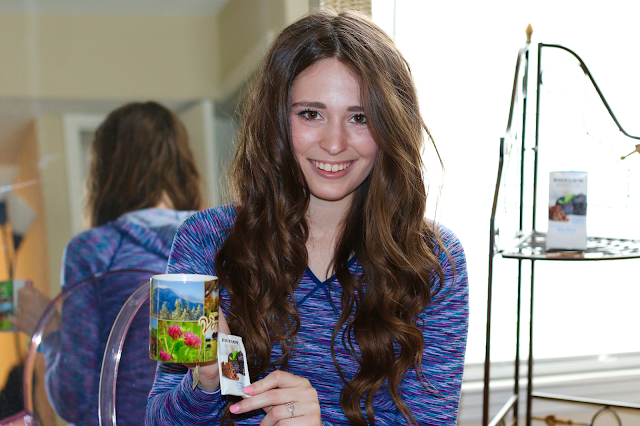 And do you like Bigelow teas? 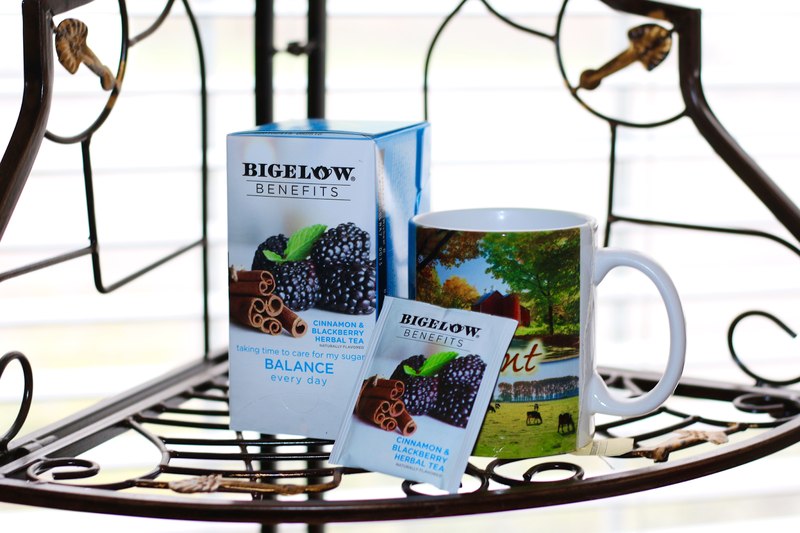 Have you tried the new Bigelow Benefits teas yet? I love Bigelow tea! I'll have to try the Benefits line! I've never tried this tea before but that's probably because I've just started getting into tea recently. I'll have to check it out. Great post! Ditto the part about getting lots of sleep. Moving jitters keep that from happening sometimes, but boy will you need those zzzz. These are such great tips! Congrats on your big move! Yes, girl, yes! It is so important to keep that stress down! Good for you! I would never have thought to schedule out goodbyes. Such a good tip and to make sure you see everyone before you leave! May need to keep these tips in mind! Getting a great amount of sleep is SO key! Tea is my life saver! I actually just moved back home on Monday from University, it is a long day and lots of stuff! I was really rushed because I was writing an exam that afternoon, so my parents pack my room into the truck while I was in the exam. It was a little bittersweet, I came back to a empty room and didn't have much time to really say goodbye to my home of 8 months. But it is really nice to be back home! Moving can be so stressful. I always turn to tea when I'm stressed and need to unwind. So many good tips! Packing with a ton of labels is easiest for me! Nowadays relocation has become more simple of course. There are a lot of good moving companies that have a lot of moving calculator from transportation to storage, which makes the whole process easier.